Compared to conventional halogen illumination, these high intensity LED sources need only about one third of consuming electricity and last approximately 30 times longer. The MA100N ensures stable sample observation with uniform color temperature even in different light intensity. Nikon developed the new MA-SR-N Rectangular Stage especially for the MA100N. 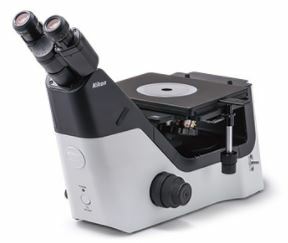 The three-plate structure gives the microscope superior control and durability for observation of heavy samples, such as a grinder resin mounted samples. The epi illuminator comes standard with a variable aperture diaphragm to control image contrast and depth of ﬁeld.